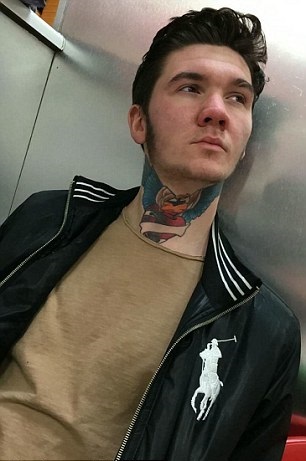 A job hunter says he has been unfairly discriminated against after being rejected from 30 potential employers because of a giant neck tattoo dedicated to his late grandfather. Joe Parsons, 21, got the £250 six-inch throbbing red heart with turquoise angel wings in memory of his grandfather Thomas, who died in a care home aged 63 last year. He got the inking while he was working in a factory, but claims since trying to get a new job he has attended 30 interviews that have gone nowhere. He has tried attending interviews wearing high-necked shirts but the tips of the wings still peek out above the collar line. Mr Parsons, of Collyhurst, north Manchester, insists he doesn't regret getting the extreme body art - but wishes potential bosses could see past it. He said: 'Before I got the tattoo people thought I was a happy, confident person. Now it feels like people think I'm full of my self and that I don't give a damn. 'That's just not who I am. I'm just a normal person and all I want is a decent job. 'There's definitely a stigma attached which there shouldn't be. I do think it's a form of discrimination. 'It's not down to the skills I have and in every interview they haven't given me a good reason. 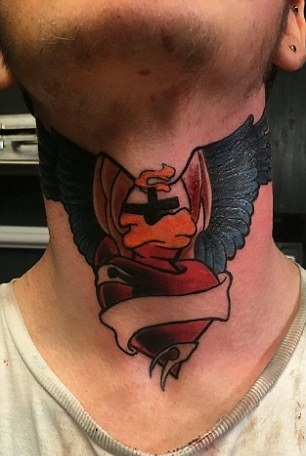 Now I feel like I've got 'don't hire me' written all over my neck. 'I don't want to get it removed. It means so much to me.